Michigan is on the verge of passing a "right to work" law that experts say would be a massive symbolic blow to the nation's labor movement and could set the stage for further such legislative fights. The law would allow workers at unionized companies to not pay dues to the union, severely cutting the funds that give unions their strength. The legislation, which won key votes in the legislature Thursday, could be signed into law next week. Forms of the law are in 23 states, mostly in the South where unions are weak. But Michigan, where 17.5% of workers belong to a union and where the United Auto Workers union wields tremendous economic and political power, would be by far the most unionized state to pass such legislation. "Michigan is not going to turn into Mississippi if it passes," said Gary Chaison, professor of labor relations at Clark University. 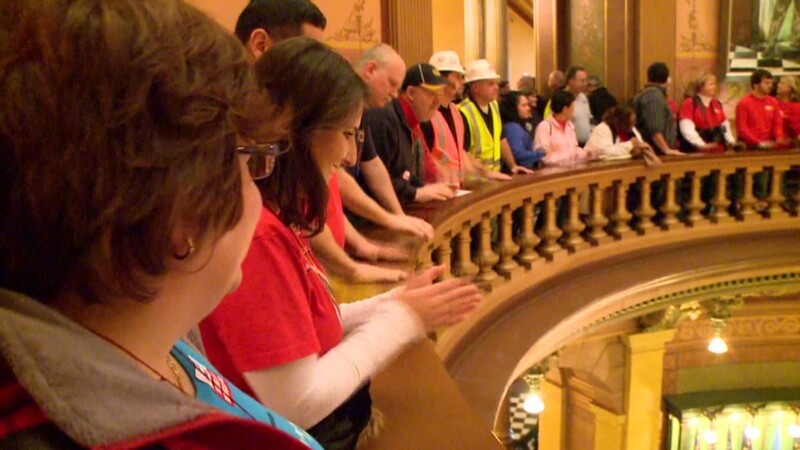 "But the symbolism of having a right-to-work law in Michigan -- it's tremendously important." Indiana passed a similar law earlier this year. Before that, it had been a decade since any state passed such a law. Opponents fear the vote in Michigan will bring action in other states in 2013. "The funding issue is huge. If all 50 states passed right-to-work laws, it would kill off private-sector unions," said Chris Edwards, economist at the Cato Institute, a conservative think tank which supports the laws. Advocates of the laws, such as the U.S. Chamber of Commerce, argue it will attract businesses to Michigan by making the state more business friendly. "As states fiercely compete for jobs, this legislation will ensure that investors know Michigan is the place to do business," said Michigan Gov. Rick Snyder, a Republican, in a statement Thursday. Critics of the law say the weakening of the union's financial and bargaining position leads to lower wages in right-to-work states without doing much to bring in more jobs. "Companies for whom low wages are the core of their business model are going to Mexico or China or Vietnam, not South Carolina," said Gordon Lafer, professor of political science, labor studies at the University of Oregon. Michigan voters rejected a referendum that would have made such legislation unconstitutional. Union foes of the bill say both union and nonunion workers in the state will lose out because of the lower wages they believe will result. "We've got to remember it's real people and real workers who will be hurt by this," said Jon Hoadley, campaign manager for the union effort to defeat the law. "It's going to be symbolically and financially troubling for everyone in the state."